I've taught students about the importance of terracing to cultivation, and so the possible population density of the hill country of Palestine. I think I saw a reverse illustrative example today. Above us on the hill (here at the Akha Hill House in northern Thailand) there are cultivated bushes. In the photo you can see what I saw, the bushes higher on the slope are consistently smaller and those lower down larger. I assume it is greater availability of water and nutrients lower on the slope as they (and also topsoil) are washed down in the rainy season. Should blogging count for academics? Many academics now blog. [Cue crusty elderly mumbles about how back in 2006, 5, 4... there were merely a handful of us...] So, the issue of whether, and if so how, blogging should "count" among academics is a live one. There is, certainly nothing like a clear common answer. Even among blogging-academics the topic has been hashed and rehashed, but little light as emerged. service: a rag bag for anything else the academic and their evaluators think of as "work", committees, consulting, speaking to non-professional groups etc. The current posts among biblical studies bloggers, opened the conversation with Stephen's Academic Blogging: Publication or Service? and also Mark's response Academic Blogging: Publication, Service or Teaching posing the question in terms Marx would have approved. Does blogging "count" as work, and if so of what sort? In other words the question is economic, should I/we be paid to blog? Jim in a typically forthright reply poses the question differently in Blogging: To What End? and Mark offered a typically reflective answer in Why blog? I'll answer Jim's question briefly, and then return to the original one. I blog because I enjoy the intellectual stimulation of reading other people's posts, and I hope that (by blogging myself) I can add a different voice and perspective to the mix. In short I blog for the same reason that I do not (despite being a raving introvert) sit silent in a corner during conversations in the Carey staffroom, or the church coffee room after the service, because I feel part of the community. So, back to the question should blogging count as work for academics? And yet, these freedoms, and especially the freedom to research, have been restricted over the years. When I began at Carey in 1993 we taught typically 4-5 courses a year, 2 larger courses (maybe 25-35 students) in one semester and 3 smaller ones with 7-20 students in the other. This left plenty of time for research and service, and these activities were not rigorously assessed. If my research produced no publications some years, but I wrote a series for the denominational paper, that was fine. Should blogging "count"? I do hope not, because if it does, I'll need to produce "n" posts a year, and remove from Sansblogue any posts I fear will not meet the approval of some committee. If blogging starts to "count" then the biblical blogsphere will become a mass of turgid, safely academic, posts full of language designed to impress rather than to communicate, relieved only by the amateurs - used in it's deep sense of someone who undertakes an activity for love rather than payment - and the outsiders. I think that blogging should "count" only in the sense and to the extent that things like radio interviews, books with trade publishers, and other such activities do. It should be appreciated as drawing attention to our work and the institutions we're affiliated, but not expected in the same way peer reviewed publications or teaching a certain number of classes are. Thanks for keeping this conversation going - it is an important one! James, the post above was a rant, deliberately overstating a case to make a different point, as my next post above hopefully shows ;) Actually I think blogging, subject to the sort of evaluation the MLA team suggest, should count both as you suggest in the service area, but often also rather like papers to academic conferences. That is as a sort of quasi- or preliminary publication that services the research community. It reminds me why Illich is so important, still. We (meaning teachers) get so caught up in the technology of teaching (meaning not equipment, but learning outcomes, clear syllabuses, marking criteria and the rest of the techniques which we are told will make or teaching better - or at least better fitted to the educational system of which we are a part). I find it a little troubling. Aren't there places in the world where the teaching example is important for the inspiration of a few individual who will in this way realize a potential they might otherwise have missed? I am thinking too of the schools for girls in Afghanistan which the insurgency does not want - or your school in 'far away places' that you taught in. The interaction with one teacher - it is personal - will encourage as much as 'amo amas amat' and other tabular forms of rote learning might discourage. BTW - I have had some real success with one 11-year-old over the past 10 months. He is inspired by the 5 minutes a week on a single Hebrew word or letter and has started with his Mum some weekly 1 hour lessons in reading Hebrew - his speed is marvelous and his daily practice makes him his mother's teacher already - after just two lessons! I will close my eyes and pray the little scholar can find his feet and keep enjoying learning. I had some thoughts on this video at http://learnonline.wordpress.com/2009/03/06/illich-makes-a-come-back-at-last/, where I first saw it. Illich's work is very useful however in some ways we might compare him with Marx's work on capitalism - a very good critique, but not much in the way of a viable and sustainable alternative. Learning from Illich is not the same thing as doing things his way, something I am very grateful for. The comment Mark (Nichthus) mentions is here It is (as you'd expect, sensible and worth reading! Bob: personally I read Illych as a critic. I don't take everything as a program to follow. I would not have spent more than 25 years teaching if I thought teaching was worthless. But I do believe that too often teaching and learning get caught up in educational systems which prioritise mass production of "knowledge" at the expense of either developing real skills or the wisdom to use them (knowledge and skills) well. Several bloggers have spotted and amended (maybe an amended version of the amendment will return one day) Scott Bailey's Genesis 6:1-6 (SBV) in the light of the interest this passage is eliciting, and to return the discussion to the biblical text, do please listen to this MP3 reading of the passage. I think this reading has been very well planned and executed to capture the meaning (or at least what seems to many the most likely meaning) of this notoriously difficult passage. The Bible Style Guide may be "a reference text designed specifically for those working within the media industry." But the "crash course in the Bible" it offers is good for far more than just "busy journalists, broadcasters and bloggers." It combines a very brief, down to earth, and wise glossary of key terms that people use when talking about the Bible. With a crash course in the nature of biblical literature, translation and the Bible in today's world. There is probably no one who can not learn something from this free 70+ page book! think Ebionite is a sort of ancient plastic? a Codex is used to decode secret messages? that a canon goes "bang"? Just get The Bible Style Guide and look it up! The answers are neat, quick and sensible. Kids, do you think the Bible is old fashioned but confused because you were brought up to think it a Holy Book? Just get The Bible Style Guide and browse through it like a magazine. Mature Christians (that's code for "not longer young" and somewhat stuck in a rut) just get the (totally free) Bible Style Guide and discover something new and inspiring - before breakfast. Teachers, fed up with people who do your Intro class yet still think the Catholic Epistles were written by Pope Benedict? Point all your classes to The Bible Style Guide and then warn them you'll get tough on people who have not at least mastered its under 80 pages! I took a look at Omnisio today. It is a tool that allows one to associate video clips with slide presentations, and then allows users to comment directly on the video. It sounded cool and useful. I chose to watch Merlin Mann's Inbox Zero talk. Watching him speak, as well as hearing the talk with slides should be so much richer, I thought. And some intelligent comments from other previous watchers would be added value. In fact it is the worst of multimedia meets the worst of "Web 2.0". Since you have good sized video and good sized slides, with OK sound the presentation did not so much stream and trickle with frequent annoying hiccups. Make the video smaller, maybe compress the sound a little more and that combination would be great though (or deliver it from a DVD for real quality). The comments, of course are not intelligent, they are anonymous and crowd out the video with such gems as "Great!!!" repeated 16 times at various apparently arbitrary points. It might have been interesting to know that the chair (that almost appeared in the video) was Ikea, but it was irrelevant and so just another blot on the video. All in all a big disappointment. The multimedia aspect is brilliant, the combination of video and slides has the potential to offer so much more than slides and audio alone. Except in this implementation it does not work. Both slides and video are smallish (about 480px wide each) which is unavoidable for web delivery, but they are not small enough (at least on NZ's rather narrow "broadband"). Bigger slides with smaller video in one corner (think Camtasia with a webcam) would download faster and give a fullscreen experience. Web 2.0 is great, when users contribute usefully. The "wisdom of crowds" works (at least often) and applications like Google Earth and sites like Flickr use publicly contributed resources brilliantly to provide a growing and useful body of material. But do not give me the folly of "Anonymous" once humans are sure they will not be identified we tend to give reign to our baser instincts - in this case a plethora of useless, annoying and occasionally rude comments. Which proliferate like rabbits, at times almost hiding the presenter behind a barrage of meaningless verbiage. Make users login, identify them and provide their email address so that particularly crass and stupid "comments" can get the feedback they deserve, and you'd have a brilliant opportunity to interact with the video. (Probably you'd need to put most comments outside the video and only put those which like the "Ikea chair" comment relate directly to some visual element on the video itself.) But you can't do that, because of spam, once again spam ruins a potentially useful tool. 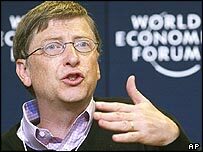 Do you remember back in 2004 when Bill Gates multi-billionaire philanthropist and founder of the world's biggest software company proclaimed that the spam problem would soon fixed? Spam will be a thing of the past in two years' time, Microsoft boss Bill Gates has promised. Nice one Bill! Sorry the Omnisio experience wasn't up to your expectations. Admittedly we have optimized for consumers with reasonably fast internet connections - I would recommend opening the window in the background and letting it buffer before watching it. Also note you can click the icon in the top left corner of the slides or video to adjust the size (e.g. if you want to get the small video + large slides layout that you describe). The fullscreen button should also help. We are working on the anonymous commenting issue. Thanks Ryan, I hope I did not sound too negative, and after the event I realise the "clever" title might increase that danger I think the idea is great. The speed issue will resolve itself given time ;) I think that the commenting issue is the real killer, at present it makes the system simply unusable :( So I'll be delighted when it is fixed. Maybe a "view only signed comments" feature? Mark has set up a wiki to provide help for the free Bible mapping tool Bible Mapper. The idea is that (since BM comes free but with no support or help files) the community of users could help each other. I noticed exploring his wiki that David Barrett the creator of Bible Mapper has already chipped in with an answer - this seems a good way for David to be able to provide assistance for users, but without being committed to offering organised regular help, for which surely he'd have to charge! There is an RSS feed, for compulsive Bible Mappers (like me) to keep up with all the questions and answers or new maps that people upload. BTW if you do not subscribe to David Instone-Brewer's superb Tyndale Tech Briefings - DO! This time he covers Bible maps and mapping with a really useful summary of much of (the best of) what is available. wicked man.... it's not phobia, it's disdain. Hi, Tim. Mark here. Since you already had a PBwiki account, all you needed to do was contact me via the "Contact the Owner" link at the bottom of the front page. You are now officially a "Writer" for the site! BTW, once you post your question about the rivers on the wiki, I will try to provide additional info, perhaps even a video. In the meantime, try CTRL-F to Find and then right-click to edit the river. Kevin Wilson has been reflecting on the difficulties of cramming too much into introductory courses. In particular the conundrum that if you ask students to read the Bible (in an Intro to the Bible course) there is no time to read a textbook too. Charles Halton also chipped in, admitting: "I don’t have good resolution yet." to the problem of "the ratio of primary and secondary readings". Do not set the Bible as required reading. If your students do not read the Bible for themselves, or at least listen to the podcasts, then they really have little interest in the subject, so leave those students to flounder! Actually seriously, there is no way to set reading the whole Bible as required reading, so set and use only small chunks, and make talking about them so interesting that students will want to read more... as always in teaching we need to remind ourselves that "sugar catches more flies than vinegar." Computers in class :: or a false view of teaching? BUT, the whole conversation is again so wrong. The "lecture" should not ne something you can, or would want to transcribe! Think about it, if it is transcribable why not just buy the book, a $20 paperback costs far less per student than a teacher and you can read it when you want - and you can choose a "better" teacher ;-) The lecture as a means to transfer information and ideas (as data) is inefficient and inconvenient, compared to print. Use the "lecture" time to do more, add value, get students engaging with the ideas and information and long term they will learn more. In his post Web 2.0 and experts: a metaphor Nichthus continues to ruminate on the relevance or place of Web 2.0 approaches to teaching. This time he proposes a thoroughly Kiwi metaphor: refereeing decisions at a rugby match (I'm sure denizens of other sports-mad nations can translate ;-). Of course, in terms of the Rugby match he's right, no one but the blindest, most one-eyed fan would want the crowd consulted over a difficult point of interpretation of the rules of a sport that could decide a world cup. BUT is refereeing a match, or indeed any other decision making process, the best model for teaching and learning? By this I mean: when I learn am I placed in the position of a referee who much decide what is "right"? In a totally, 100%, unguided system I might be, but if I have a guide or teacher (whether by my side or on the stage ;) the model no longer describes my experience or the process. In teaching and learning the question is not: which decision will be taken - was it a try or not? Rather the issue at stake is: will the learner acquire the desired information and skills, and through what process will they be best facilitated in this learning? Thanks for your thoughtful post. Actually, my target in the post was NOT teaching and learning. It was the role of and need for the expert. We both agree that "is refereeing a match, or indeed any other decision making process, the best model for teaching and learning?" when we answer NO! But it DOES point out the difference between those with the best view and those watching from the sides. I have a part B post that you may also be interested in... watch that space!